Pancrezyme (pancreatic enzymes) is a prescription medication that provides digestive support for cats and dogs with exocrine pancreatic insufficiency (EPI). Pets with EPI do not produce an adequate amount of the enzymes needed to digest proteins, fats, and carbohydrates. This medication contains a natural source of enzymes that includes amylase, protease, lipase, peptidase, nuclease, and elastase to help make up for these deficiencies. 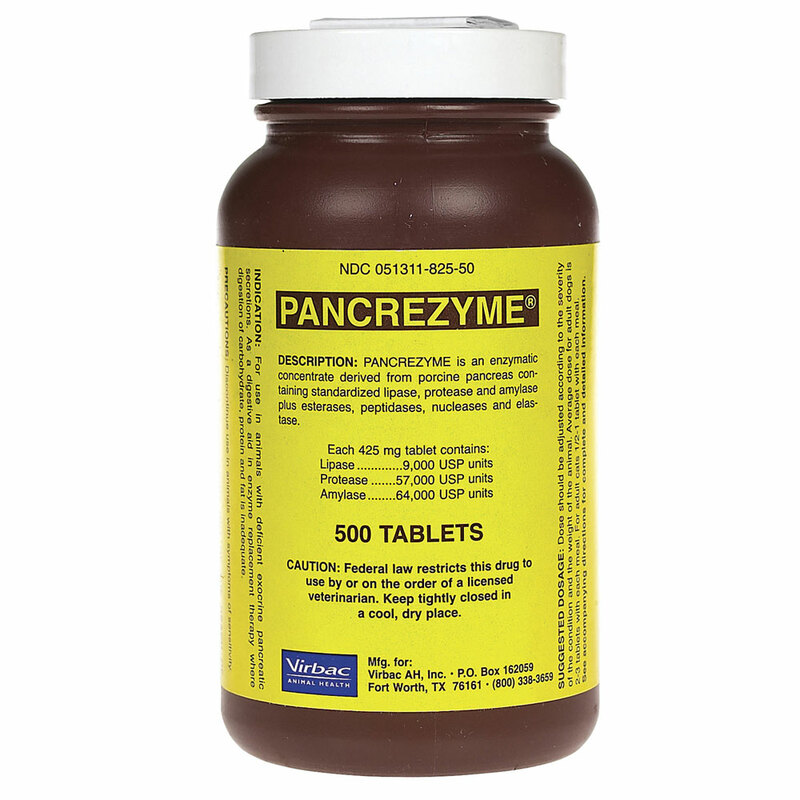 Pancrezyme is a form of pancreatic enzymes normally produced by the pancreas for the purpose of digesting and absorbing fats, proteins, and carbohydrates It is used for those pets in which the enzymes are not produced naturally and in sufficient quantity. Indications: Pets suffering from EPI may suffer from weight loss, fatigue, diarrhea, and other gastrointestinal problems. Pancrezyme can relieve these symptoms and thereby help identify any underlying cause of EPI, which can include Celiac disease, Crohn disease, and other serious afflictions; treating EPI can also prevent further problems caused by vitamin deficiencies that may occur due to maldigestion, such as anemia and metabolic bone disease. Esterases, peptidases, nucleases and elastase. Dosing: The usual dosage for dogs is 2-3 tablets or ¾ to 1 teaspoon of powder taken with each meal, whereas the usual dosage for cats is ½ to 1 tablet or ¼ to ¾ teaspoon of powder taken with each meal. These dosages are adjusted for particular pets, so it’s important that you follow the dosage prescribed by your veterinarian. Administration: Pancrezyme tablets should be administered before each meal, whereas the powder should be added to moistened food and mixed thoroughly. When mixed into the food- let the resulting mix stand for 15-20 minutes before feeding it to your pet. Frequent feeding is crucial to this process, and pets taking this medication should receive at least 3 meals per day. It’s also important that you follow any additional instructions given by your veterinarian. Side Effects: If your pet experiences any of the following side effects while taking Pancrezyme, stop administering it immediately and seek emergency veterinary medical attention if your pet has an allergic reaction, as characterized by difficulty breathing, swelling of the face, and hives. Talk to your veterinarian if your pet experiences diarrhea or loose stools while taking this medication or if he experiences any additional side effects. Also inform your veterinarian as to whether or not your pet is being given antacids, H2 blockers, or proton pump inhibitors.